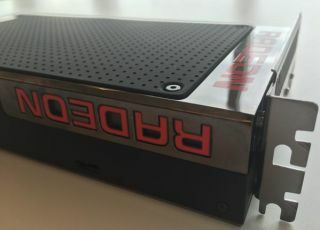 AMD's next-gen flagship graphics card has finally been shown off to the world — by EA technical director Johan Andersson, obviously. It does make sense, actually, as Andersson is one of the minds behind the Frostbite engine, and it was Frostbite that was the first of the 'big' engines to support AMD's Mantle tech. Anyway, the card — unofficially known as the R9 390X — is rumoured to feature water cooling and four 1GB HBM (high-bandwith memory) doohickeys (not the technical term). This means it will have access to greater bandwith, take up less space and will lower power consumption, which is pretty damn cool. We've known officially for a couple of weeks that AMD's next-gen GPUs will feature HBM, but it's no less exciting to see one out there in the the wild. It looks so... tiny!